So recently I sorted out my room and by sorted I mean threw away a LOT of stuff, I am a bit of a hoarder considering I found Birthday Cards from years ago, clothes which definitely do not fit and shoes I would not wear again in this lifetime ever. After clearing out my junk for about 3 hours I finally had space to make my room how I want it to be, so I decided I would sort out my huge collection of make-up and make my draws look a bit more presentable! First off I started with my shelf which was filled with perfume, foundation and hand sanitizers (bath and body works ftw!) 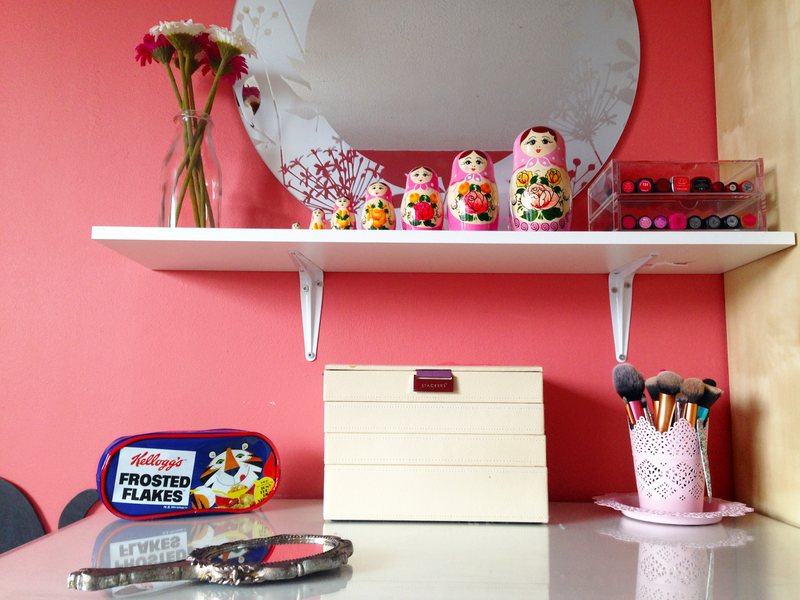 I used to have the flowers underneath the shelf but I thought it looked pretty cute next to the Russian Dolls. Talking of the Russian dolls, they were a present from my dad who works in Russia, and I love them even though I lost the two bigger ones for ages.. and they also appeared during my bedroom clean up! The draws were from Muji and I love them, I think they're perfect for storing my favourite lipsticks which I would name but that would take a fair while and would be boring for those none lipstick lovers. On the top of my drawers it was covered in make-up, random bits of paper and other strange things.. 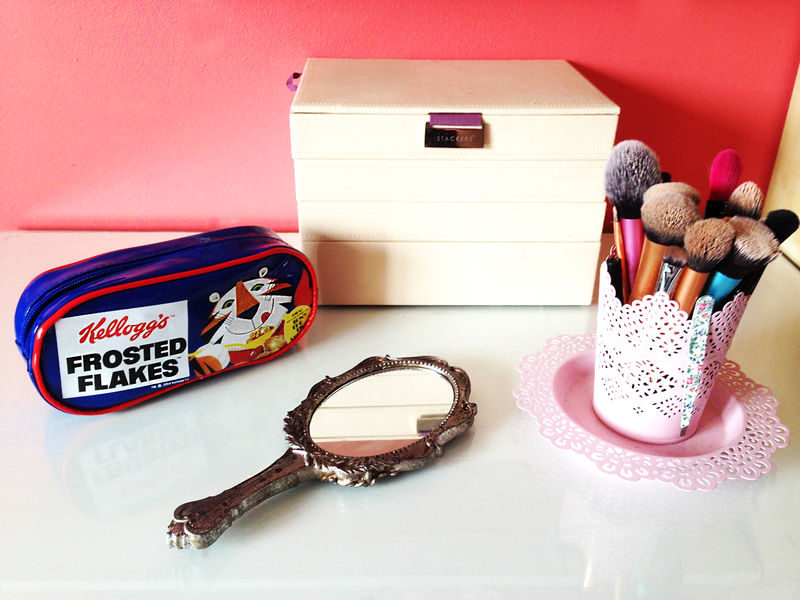 BUT now it looks pretty, and even after it being two weeks since I did this, I think it looks exactly the same, I love this Frosted Flakes* make-up bag, I think it's awesome because it's retro and just suits my style. Next is my Stackers Jewellery Box which I love it has so many compartments and looks lush on the outside and it's made from leather. In front of that is my new favourite thing, a Romantic Handheld Mirror*. I know some of you will be thinking it's just a mirror, but to me it reminds me of a Disney Princess mirror and it looks great, it's different and unique to any normal mirrors you can get especially if you put it in your bag. The best thing about it is, it looks heavy but is actually really light! Finally the Make-up Brush Pot, I am pretty sure it was supposed to be a plant pot when I got it from Ikea, but who wants a plant pot when you can store your make-up brushes in it? It comes in pink and white and I think it looks elegant and dainty! The best thing is it looks like it costs a bit but it only cost £1.90, gotta love those bargains! 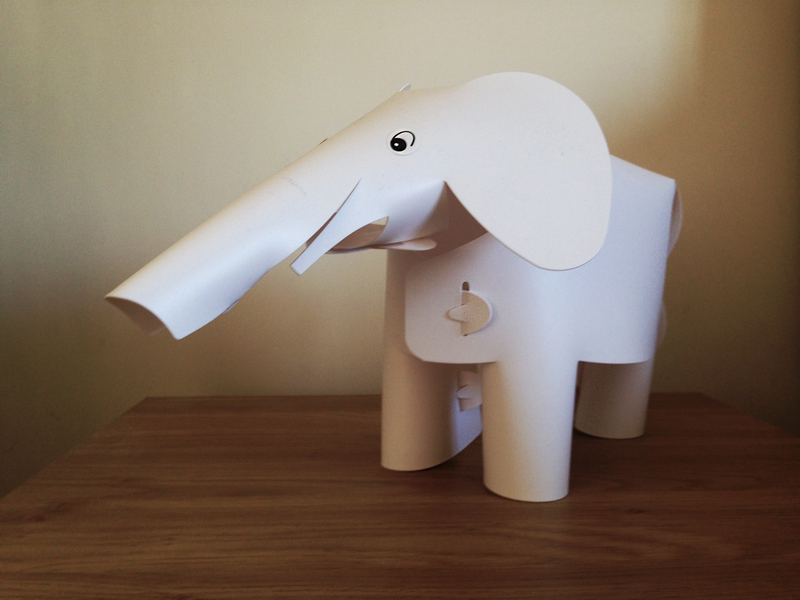 The final thing in my room clean up is this super cute Binkie Elephant* Lamp my old lamp was getting on and it was about time I got a new one, I went with this one because it's pretty unique and you are able to draw on it what you want, so you can personalize it. I am yet to personalize mine but I am thinking Doughnuts are the way forward, bright pink ones! The lamp is quite big and does take up a bit of space but I think it suits my little corner and fits with the theme of the rest of the room well. Great post. I am also a bit of a hoarder but I'm getting better. Lol. Always looking at ideas for how to tidy and organise. How gorgeous it that makeup bag! I love things like that, I may have to get myself one.